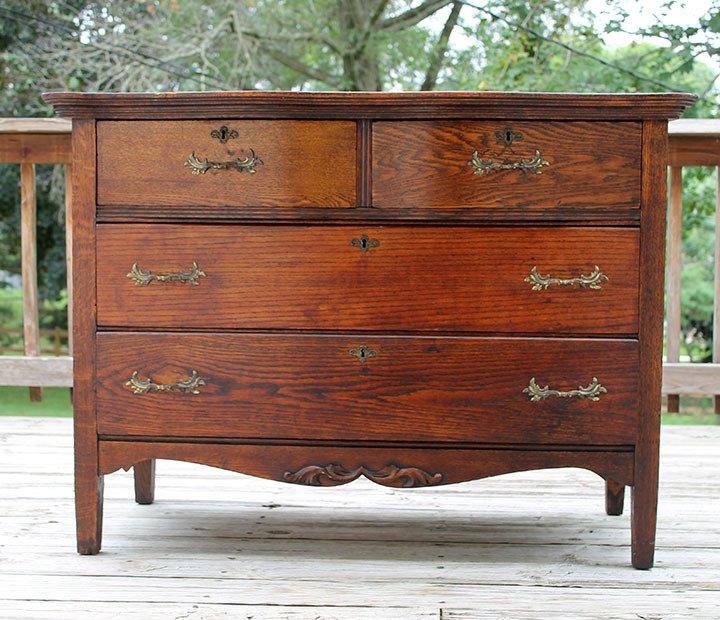 I grew up with this antique dresser always somewhere in my house. Ever have an affinity for something just because you grew up with it? Well, that’s how I feel about this dresser. It’s not quite my style, but I love it nonetheless. 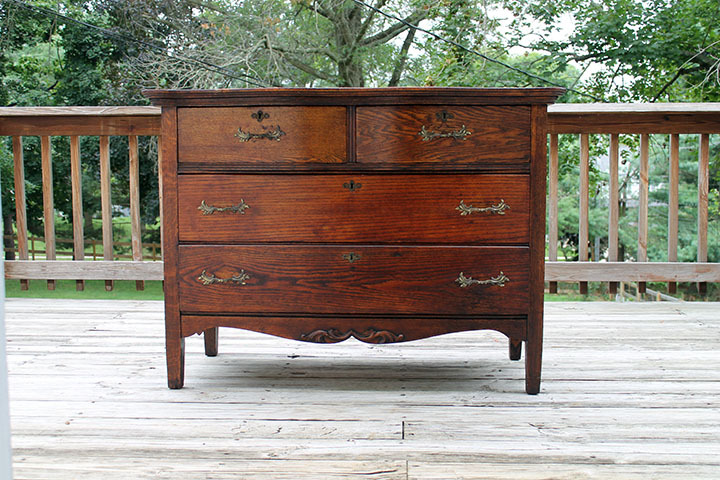 With four drawers, each with their own keyhole, and a beautiful curve — this piece is exactly what comes to my mind when I think of an antique dresser. My dresser comes with an added bonus — a small teal bead that me and my sisters stuck in one of the keyholes. 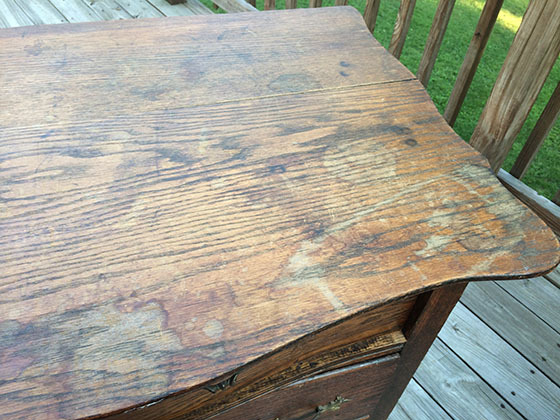 We could easily remove the bead, but it has become sort of sentimental through the year — like, oh, is that the dresser with the bead stuck in it? 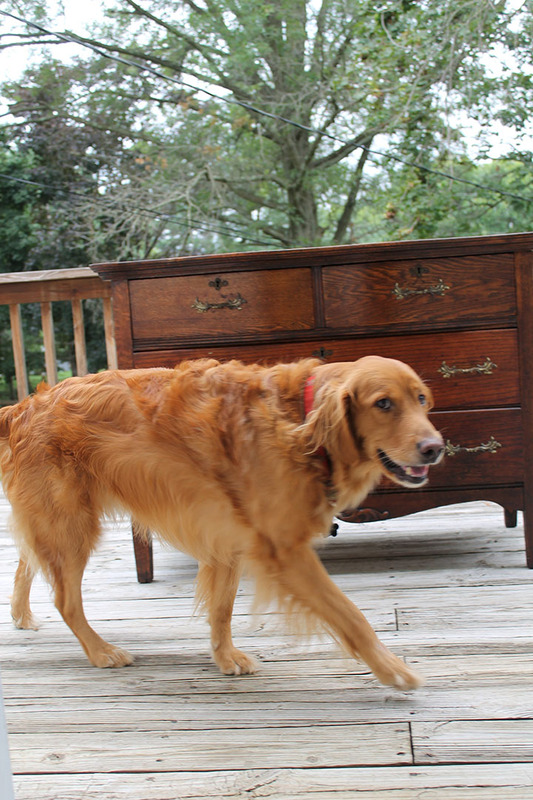 Anyway, long story short, my mom and step dad had the dresser at their hose for years. Over the years, it somehow made its way into the garage and became a storage chest for nails, screws and the like. Needless to say, it got a little bit beat up. The top really needed some love. With a crack 1/3 the way through it and all sorts of nastiness to the finish, it was crying for some help. Before I could tackle any of this, I had to clean this puppy up. 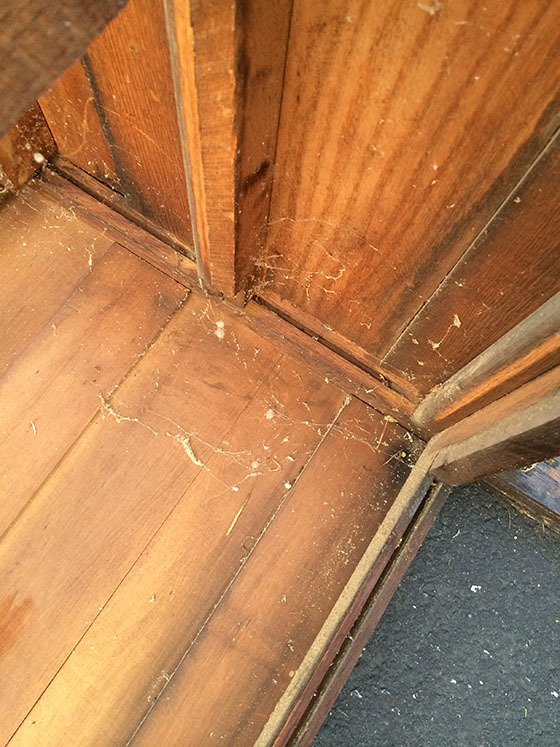 Talk about some serious spider webs. OK, back to the restoration. 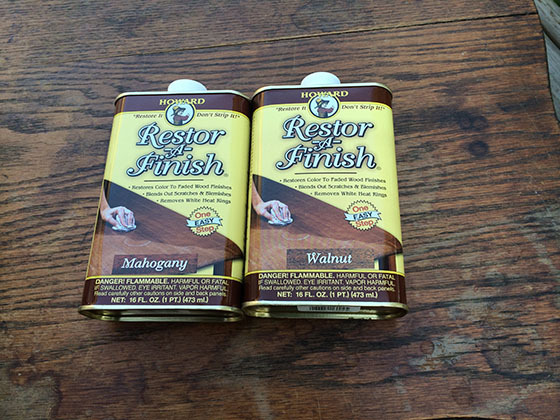 I pulled out my walnut restor-a-finish and a new bottle of mahogany finish and mixed the two together. The dresser was an in-between color, so I figured a mix would be the best option. 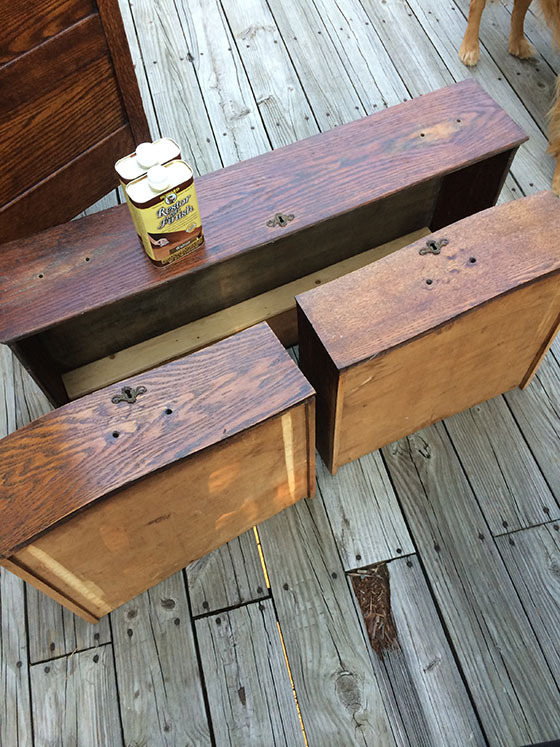 Before I started the application of the restor-a-finish, I first wiped down the whole dresser, removed the drawers and took off the hardware. You can really see the color variation in the finish in this next picture, especially underneath where the hardware goes. You might also notice some doggy paws keeping me company. I also filled the crack in the top of the dresser using Elmer’s wood filler. Once that dried, I sanded it smooth. Then, I got to restoring. 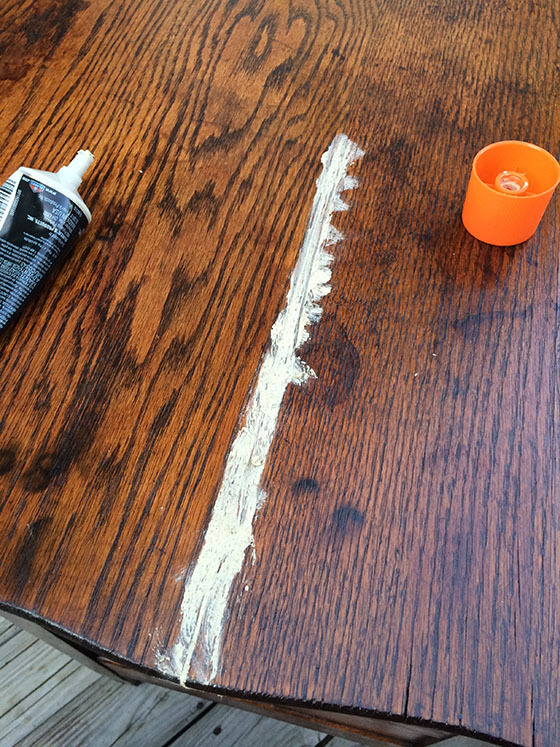 Using gloves and a ventilator mask for safety, I started applying the restor-a-finish to the whole dresser. All you have to do is put it on with a paper towel and let it soak in. In 20 minutes, wipe the finish back off. I did this twice, although that probably isn’t necessary. When that was dry, I simply added some feed-n-wax to the piece. You use the same method for the wax — wipe it on with a paper towel, then in 20 minutes remove it again. And that’s it! I reattached the hardware and put the drawers back in. Check out that top! All sorts of fancy and nice. Here’s another shot. 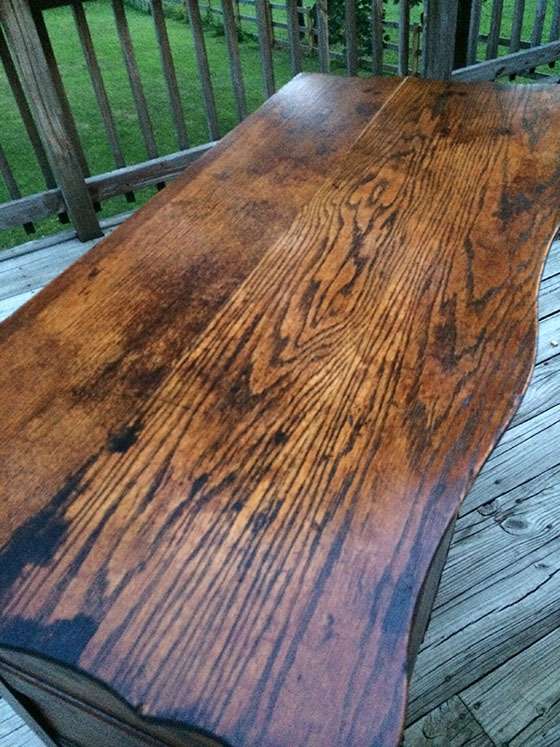 You can see there are still scratches in the top, but they don’t stand out anymore because of the treatment done. 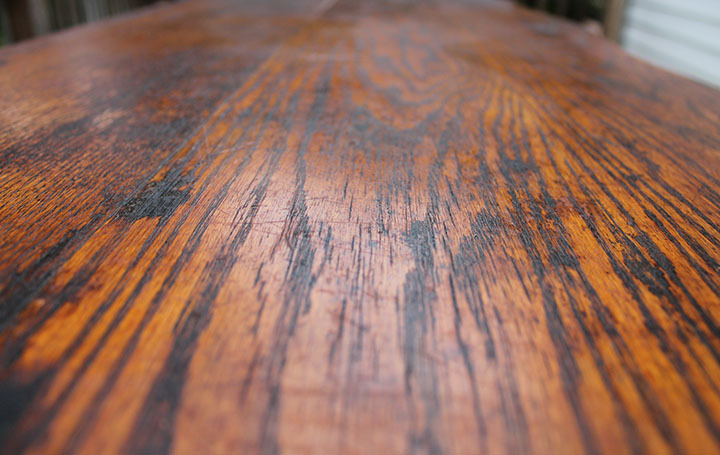 If you wanted the scratches out completely, you’d have to sand down the stop, which would remove the original finish of the piece. It’s a toss-up. The scratches don’t bother me, so I opted to let them stay with the original finish of the piece. Ready for the whole thing? It has such a nice color to it again! 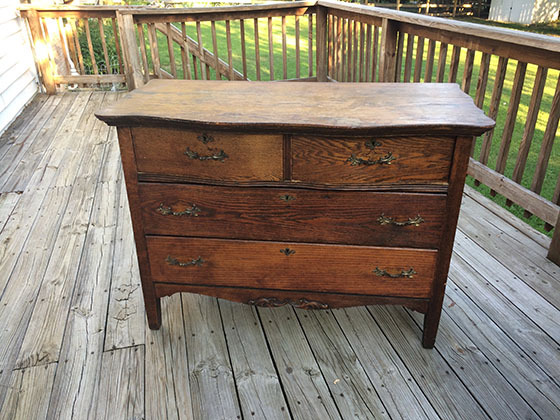 This dresser is a perfect example of not needing to paint old furniture. Don’t get me wrong — I love a painted piece of furniture, but I hate to see beautiful antiques covered with paint because people aren’t aware of their other options! 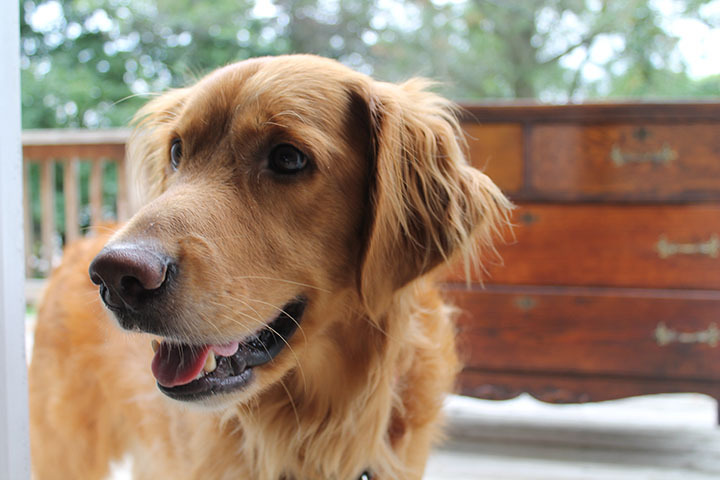 I don’t usually share outtakes from my projects and photo shoots, but Remmy was all over me for this project. I guess when his momma is outside, he’s gonna be glued to her side. 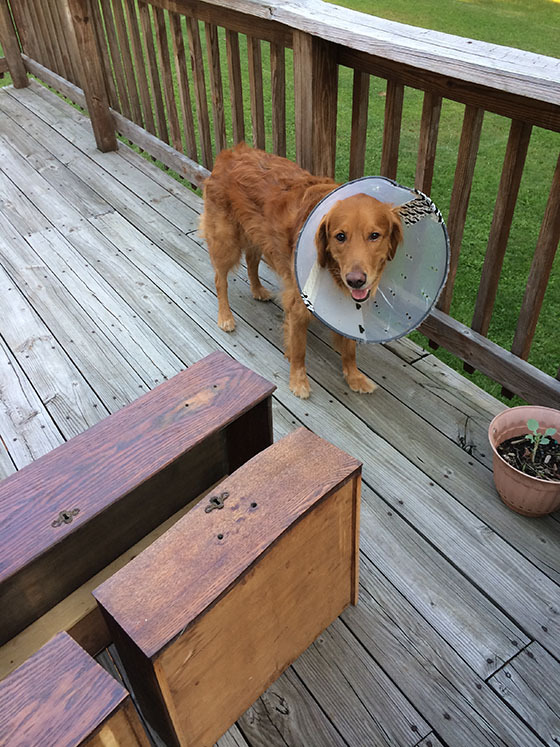 Here he is in his cone of shame. Don’t worry, he’s OK. He just irritated his paw and wouldn’t leave it alone. Don’t worry, Rem. 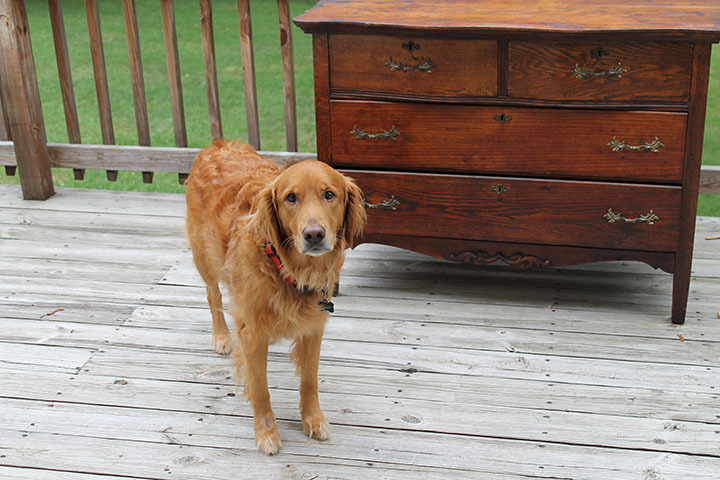 I wanted to take your picture, not one of the dresser. Staring contest. I won, he got bored.